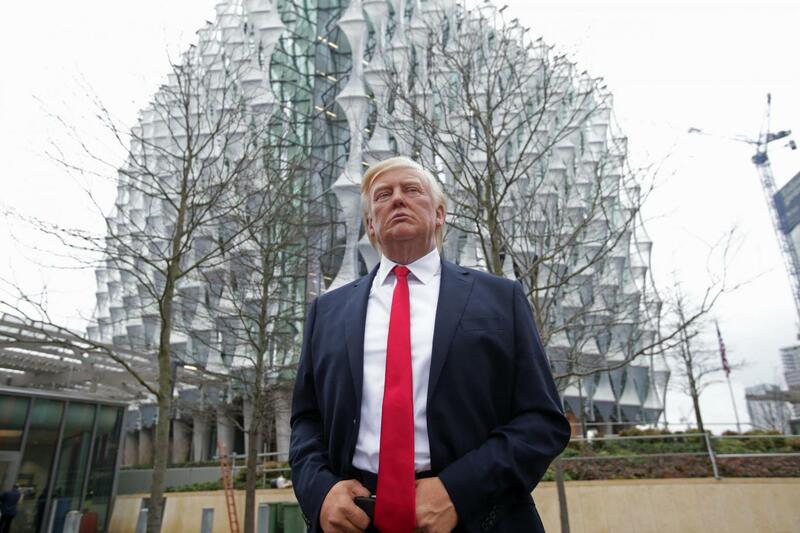 Alright, it's not the real Donald Trump but a wax figure of him from Madame Tussauds outside the new U.S. Embassy in London. More dishonesty. Trump apparently claimed that he wasn't going because it thought it was a bad real estate deal and a waste of money...caused by the Obama administration. But, it was decided on by the Bush admin, and was for security reasons. And it was paid for by selling U.S. government owned properties in London so it really didn't cost the government any "new" money to build. Viewer says more dishonesty but then talks about Trump, not the wax figure. Look at those hands, they're "YUGE". Hands like those are the mark on a man of a lifetime of hard physical repetitious work done. Mule skinners, tanners, sawyers, coopers, farmers, ranchers, miners, brick layers ... . I will have you know that Trump is always welcome in London Kentucky. A group of protesters backing Brexit and Donald Trump have disrupted a speech by the London mayor, Sadiq Khan. Khan’s address on gender equality to the Fabian Society in central London was suspended for several minutes on Saturday morning while a small number of demonstrators from a recently formed far-right group called the White Pendragons made their protest. One man shouted “No to the EU” and another displayed a US flag. I hope they had some Russian flags too, since that's how the UK got Brexit. The old US Embassy was right on Grosvenor Square, in one of the fanciest and most upper-class parts of London. The land is worth a staggering amount of money, but in fact Qatar got it in a sweetheart deal for a garage sale price. Gotta love the bush crime family and their oil buddies. Maybe that's why we had to settle for a site in Vauxhall, nowhere near the embassy district, though at least in a neighborhood with some decent night life including gay clubs. The BBC published an article with a flow chart on whether you should make a citizen's arrest. Apparently the white supremacists and Trump supporters in England didn't read it. 45 knew he was going to face storm of protest, so he copping out. Blaming the Black Guy is his go to. Just think back to when had a President who was respected...but that was the Black Guy to. His blaming Obama so many times is ridiculous. Every time he does he, Trump looks even worse. The sad thing is he, Trump doesn't realize how bad, petty and small he looks to the world. The real payoff for the DNC will come after Trump leaves office. As every other word from his mouth will be claiming that he was the greatest President in history. All the while bad mouthing the GOP.